In 2018 our tango marathon will take place in November, from 8 till 12. Belarus tango trip — a joint event of Argentine tango studio «Tango Time» and the National Historical and Cultural Museum-Reserve «Nyasvizh». The event is intended to unite all those who love the Argentine tango dance and dreams of an unforgettable tanda not only in the current capital city of Minsk, but also to feel the greatness of the 16th century, plunged into the atmosphere of the cultural capital city Nesvizh. Nesvizh Castle (1 hour by car from Minsk) included into the UNESCO World Heritage List, holds a lot of ancient secrets and mysteries. It was built in the 16th century as a residence of the well-known Belarusian family Radzivill. They were the uncrowned kings of the Grand Duchy of Lithuania. Nesvizh Castle is in some way unique. It is the only magnate’s residence in Europe that was completely preserved. The inside decoration of the castle astonished the guests with its splendor. There were 170 rooms in total. The most fascinating halls, decorated by the priceless arms collections and rare works of art were called the Royall Hall, the Golden Hall, the Marble Hall, the Hunting Hall and the Arms Hall. Moreover, Nesvizh Castle is home for the most famous Belarusian ghost – “The Black Lady”or the spiit of Barbara Radzivill. According to the legend the mother of Sigizmund ll Augustus, the King of Poland, poisoned her daughter-in-law, Barbara, because she wanted to find match for her son. Since then the mysterious Black Lady is wandering at the castle. The ghost comes at night as a warning about coming tragedies. The basic concept of our event — to combine tango marathon together with the immersion into the atmosphere of the main attractions of our country. Therefore, our guests will have the opportunity not only to dance on a beautiful dance floor, but also book a tour of the palace and park ensemble, historic sights and touch the greatness of world-famous castles. The program of the event includes dancing on Thursday, Friday and Monday in Minsk, and Saturday and Sunday in the Nesvizh Castle. Nesvizh is 1 hour by car from Minsk. We also organize transfer, accommodation and food for our guests. To register for tango marathon, use the link http://tangotime.by/registration_en.html. Make sure you receive you conformation within 3 working days otherwise check your «spam» folder or contact us immediately. At the moment the registration is available for couples and separate male dancers. In your registration confirmation you will receive options to choose. The organization of food and accommodation in Minsk is the responsibility of our guests but we will offer some variants to have dinner at and sleep. Registration for the event starts May 21 at 9 am Minsk time! Full pass for milongas of the tango marathon in case of registration in a couple 50 euro for each in a couple. NB! We help our guests to receive visas and take care of all the documents. Don’t hesitate to ask us any questions about the procedure. In your registration confirmation you will receive options to choose. The organization of food and accommodation in Minsk is the responsibility of our guests but we will offer some variants to have dinner at and sleep. Registration for the event starts May 21, at 9 am (Minsk time)! 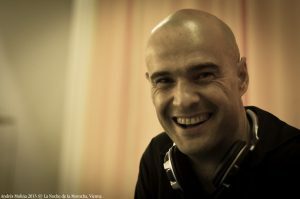 He loves all Tango music, from the beginning to the present; as DJ, he prefers the «Golden years» of Tango but carefully follows the atmosphere and the situation of the dance floor. In the recent years he was a regular DJ at nearly all of the Milongas in Rome. He is the resident DJ at La Milonga del Barrio. 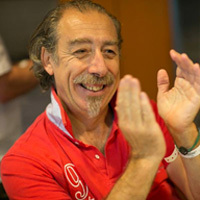 Giuseppe was invited to DJ at the following Special Evenings and Festivals: Buenos Aires (Confiteria Ideal, Salon Canning — Porteño y Bailarin, Practica 10, La Baldosa, Zona Tango, Unitango Independencia) Amsterdam, Athens, Belgrade, Beirut, Cracow, Creta, Cyprus, Dubai, Dublin, Helsinki, Istanbul, Lillehammer, Moscow, Oslo, Paris, Prague, Riga, San Petersburg, Stockholm, Tallinn, Tel Aviv, Vienna, Vilnius, Warsaw and Italy: Bari, Catania, Cosenza, Latina, Naples, Perugia, Rome, Sorrento, and more. «I fell into tango in 2008. It was natural for me not only to have passion for dance and music but also for both teaching and participating in organizing milongas, various events, and studying the history of tango, the variety of orchestras. I started to do my first steps as a DJ when I was in a fairly young tango-age. The main thing for me, as a DJ, is to pick up music so that the dancers should have positive emotions from tanda to tanda, even if at some particular moment they have rest and talk. On my milonga there is a place for lyrics, for nostalgia, for timid hope, for energetic dances and for shades of passion. I prefer the classical scheme and music, but I can experiment by adding new arrangements and new performers. I want to create a sense of the festival and the presence of live music on every milonga». Rodion’s musical taste was shaping and growing alone with his developing as a dancer and a teacher. Initially he started tango attracted by its motion, dancing and contact, but as his understanding of the very culture of tango was growing, he fell in love with music as well. 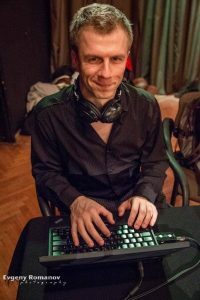 During the last 9 years he participates in Russian and international festivals and marathons as a DJ, pursuing two main goals in this role. On the one hand, it is important for Rodion that people like music and the dancer who come to the milonga do not skip a tanda. On the other hand, he wants to suggest to the audience not only well-known melodies, but more sophisticated music, which richness and profundity are better understood with the growth of the dancing skills. 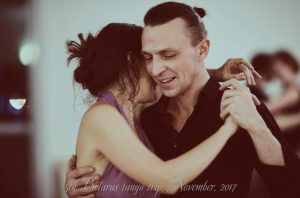 Milonga with Rodion is the full range of emotions and a challenge for each dancer! «I prefer music of the mid-20s and of the late-60s. Being a dj and a tango dancer I pay attention to the music that may bring happiness, so that to make every tanda unforgettable. 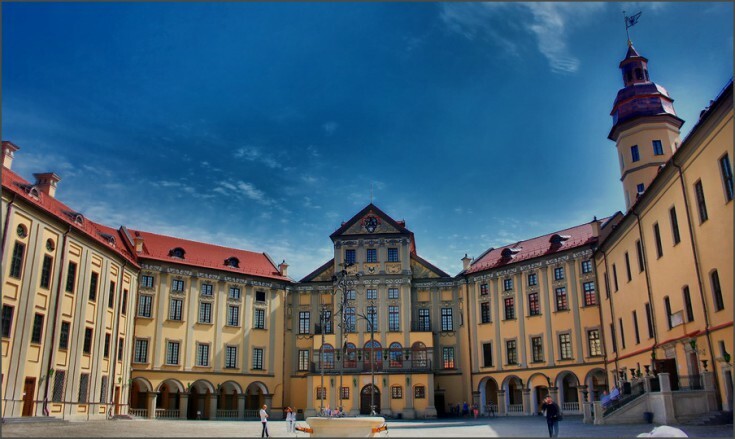 We will dance not only in beautiful Minsk, but also in the famous Nesvizh Castle. 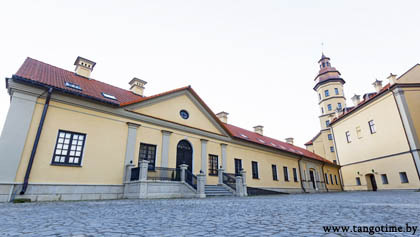 For our guests we organize meals, accommodation, transfer from Minsk to Nesvizh and back, as well as sightseeing. All of these options can be noted in the registration upon request. Below you will find links to available Nyasvizh hotels, as well as closest to the place of milongas hotels and hostels in Minsk. Each of the 22 comfortable rooms of our hotel is equipped with everything you need for a good rest after an eventful day. Refrigerator, LCD-TV, telephone for communication with the administrator, free access to wireless Internet — all this will make your stay more comfortable. Each room has a private bathroom equipped with modern fixtures, where we have prepared for your toilet standard amenities. This hotel can be booked with us only, the price is the same as the one offered by the hotel. Breakfast is included into the price. Located 1 km. from the bus station «Nesvizh.» Directions in Lenin Street, turn near DC «Kommunalnik», landmark — office «Beltelekom». The room may be booked with us only, the price is the same as the one offered by the hotel. This hotel is a kind of hostel. Breakfast is not included into the price. This year we offer apartments in Nesvizh for those who don’t like hotels. You will like cozy and clean rooms in a beautiful house 3-5 minutes on foot from the castle. To rent an apartment in Minsk — is the most convenient and (in comparison with hotels) rather inexpensive option of staying in Minsk. General price of an apartment in the city center (close to milongas) is about 40 euros. Our agent Yuriy is ready to help you with choosing an apartment. You can contact Yuriy via e-mail Giorgiomilano@gmail.com VIBER or phone +375 29 698 98 98 . 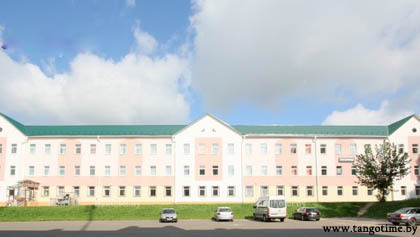 Sport hotel is an economy class hotel 3,3 km from milongas and near «Ploshcha Yakuba Kolasa» metro station. You can book a place via phone +375 17 292 12 09, +375 29 508 18 52 or email hotel_sport@mail.ru. The easiest way to reach Minsk is by using a direct flight from your city. The earlier you buy a ticket, the less you spend. Moreover if you arrive by plane and stay for 5 days you don’t need visa to enter our country. More info about non-visa travel you may find here The website you can book a ticket Belavia flights Another way to reach us (and the cheapest one) is by using a train from Vilnius. The link for the schedule is here Train tickets Sometimes the website doesn’t let to buy a ticket, don’t worry let us know and we will help you. In case you enter Belarus via train or bus or car you need a visa. We help our guests to receive a visa and make everything to make it without the consular fee, but of course it is the Embassy who decides. Full pass for milongas of the tango marathon in case of registration in a couple 50 euro for each in a couple. Full pass includes all the milongas except afterparty milonga on Monday. Afterparty milonga on Monday will be paid separately at the entrance. We also offer accommodation, food, transfer Minsk-Nesvizh-Minsk and excursion for the guests of the marathon. You can order these options with us or you can do that all by yourselves. Below you will find the approximate price.